Hostel Marina is located in a building dating from the 50's. We have renovated everything, so that the guest feel comfortable . In the common room you find a television with cable TV. You have access to a kitchen with microwave, refrigerator, a vending machine for coffee, tea and snacks , and you can also cook there. We offer a free basic breakfast every morning to start your day right. Next door is a small supermarket. Bakery, restaurants and bars are located in the immediate vicinity. Trogir lies on an island between the main land and the island of Ciovo. Trogir's historical core got its place on UNESCO's list of world heritage sights because of its beauty and cultural value. Walking through the streets of Trogir is like travelling to the time of Greek, Romans and Venetians.The northern entrance gate into the city is kept by a statue of St. John. The fortress Kamerlengo is located in south-western part of the city, and dates back to the 15th century. 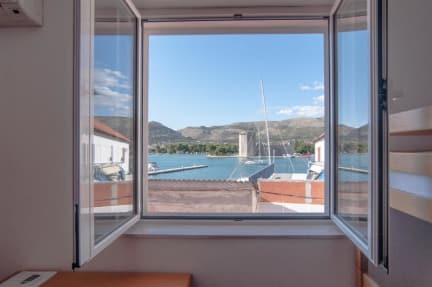 All rooms are air-conditioned and some with views of the marina and the Riva of Trogir. Every bed has it´s own locker. Amazing staff and a very welcoming experience. Thanks for having me! Great hostel in a nice location on the marina in Trogir. Staff are very friendly and helpful. The interiors of the hostel are really cool and it has a really nice feel. There's a large kitchen area which has a sociable atmosphere. The free breakfast is a really nice touch and a good way of meeting people. Good AC and large secure locker space. The rooms feel spacious. I definitely recommend a stay in Trogir as it's a lovely place to explore and there is lots you can do from there. Absolutely great hostel in all aspects, one of the best locally owned hostels I have stayed in before. The current staff, Jon, was great by being very helpful and creating an enjoyable atmosphere. The owners, Ollie and Angie, made the stay feel like I was a guest at their house (though they live in a different location). Great quiet location. Very clean and well-thought out like a corporate hostel chain but had an interesting personal feel to the hostel. Would recommend. Super nice and helpful girl working the counter. Great/clean shower/bathroom. View of the marina. Located really close to the bus station (went to Split in 30 min). Only thing is an uncomfortable bed. These guys were great. I had to cancel one night of my booking last minute due to a change in plans and they were really supportive and refunded me the night! 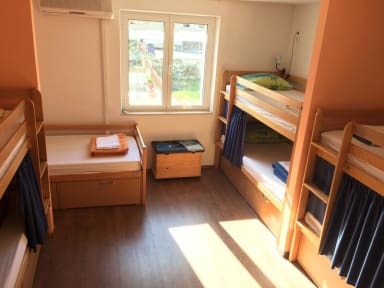 The beds are comfortable, there are large storage lockers and the views from the dorms on the harbour side are superb! It is closely located to old town and only a 15 minute walk from the bus station. Breakfast includes bread and jams. It was quiet when I was there. The owner is very knowledgeable about the area too! Would stay again. After a very long day of travelling I was greeted at this hostel very welcoming. It was towards the end of the season so everywhere in town was a bit quiet but I really enjoyed my stay here. The staff and owners were so friendly and the beds and bathrooms very comfortable. I would definitely love to stay again and recommend it to anyone visiting Trogir or Split. A little walk from the old town but with a pretty view over the harbour. Staff is super friendly, i immediately felt welcome! The beds are so so comfortable and lockers fit your whole backpack. Wifi wasn't the best but I heard it's pretty bad in the whole town.